But after suffering my 17th migraine of 2018 (I keep a migraine journal), I couldn’t take it anymore. I desperately needed relief. By any means necessary. Drill a hole in my skull? Sure, how soon can I get an appointment? Anyone who suffers from migraines can probably relate. I just couldn’t take the throbbing, pulsing pain another day! My migraine attacks were not only affecting me physically and emotionally. They were also taking their toll on my bank account. I had already used up all my sick days because of the attacks. Fortunately, about 6 months ago, my doctor told me about something he uses called Migraine Care. It’s the only thing that’s ever significantly relieved my pain. In fact, I haven’t had an attack in over 4 months—the longest I’ve gone without one—because it works. Used regularly, it has changed my quality of life. I’ve tried both prescription and over-the-counters medications, all of them. Sometimes they would help, but most of the time, they work no better than drawing the curtains, turning out the lights, pulling the covers over your head and riding out the attack in bed. It’s unbelievable to me that humans have put a man on the moon but we still don’t know what causes migraines. Experts are now turning back to plant based medicines for pain management with amazing results. Research has shown 5 specific plant extracts to be highly effective in relieving the symptoms of migraine headaches. These 5 plants are cold pressed into pure therapeutic grade essential oils, custom blended for maximum migraine relief. 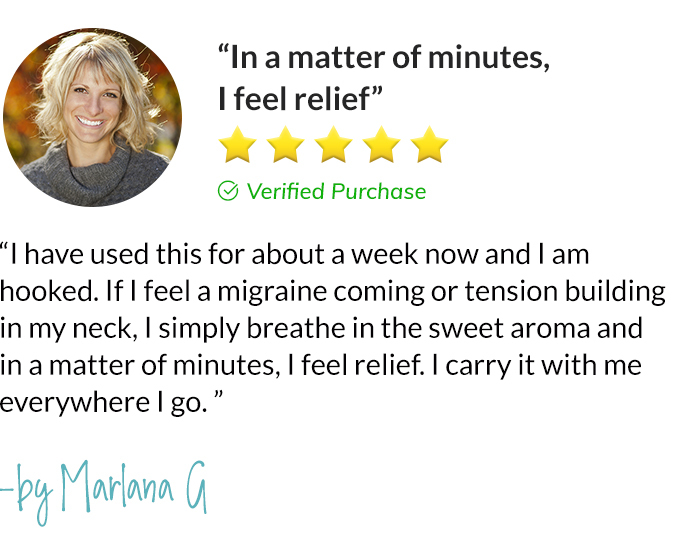 Migraine Care’s all natural ingredients give me peace of mind when I need it most. I use it every day and no longer have to leave my desk at work to hide in my car every time a migraine strikes. And if I have a feeling that an attack might be around the corner, using Migraine Care stops the impending doom in its tracks. This unbelievable new product has given me a new lease on life. How Does Migraine Care Work? I did some research of my own on the 5 plants that are in Migraine Care. Here’s what I found out about them. Says a study in Phytomedicine (“phyto” means “plant”) efficiently alleviates tension-type headaches. It causes a significant increase of blood flow to the forehead and contains analgesic (pain-relieving) properties. 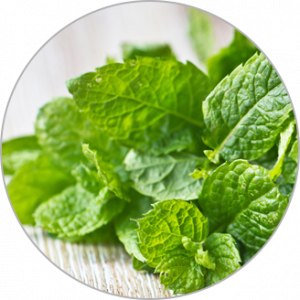 The combination of peppermint oil and the other oils in Migraine Care boosts brain performance while having both a muscle- and mentally-relaxing effect. (salvia) improves brain function and even improves memory. 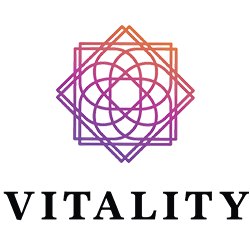 Sage essential oils have been used in the treatment of a wide range of diseases such as those of the nervous system. In addition, sage essential oil has been shown to relieve spasms. 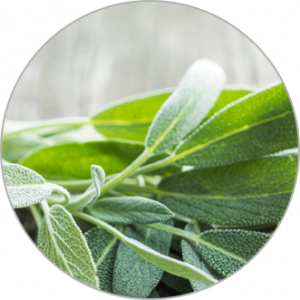 Ursolic acid, a component of sage, has strong anti-inflammatory properties. According to Neurology Advisor, inflammation may play a significant role in migraines. contains chemicals that reduce swelling, according to WebMD. As anybody like me who has experienced the debilitating effects of migraine pain knows, it feels like your brain is swollen. Indeed, what happens when you have a migraine is that excited brain cells trigger the brain to release chemicals that irritate and cause blood vessels on the surface of the brain to swell. 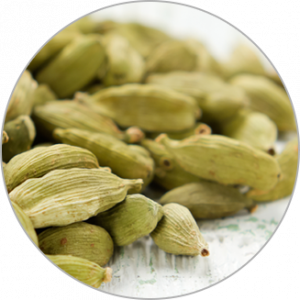 has been used to cure nausea since ancient times. Many people who suffer migraine attacks experience nausea and even vomiting. 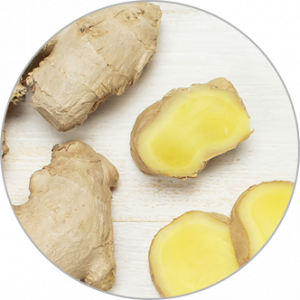 Ginger helps relieve these symptoms, as well as vertigo and dizziness. is shown in several studies to improve brain function and reduce anxiety. 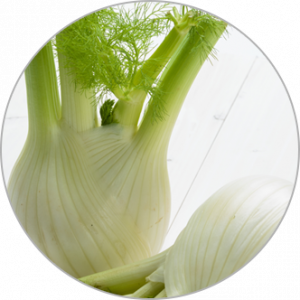 In fact, sweet fennel in one study was shown to reduce anxiety more effectively than the drug, diazepam. 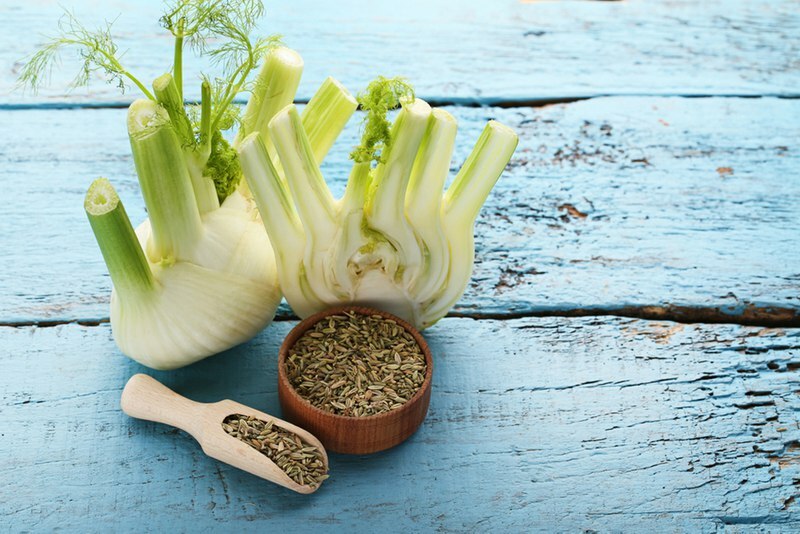 Sweet fennel is listed in the 19th edition of Pharmacology and Pharmacotherapeutics for its anxiety-relieving effects. There are 3 ways to use Migraine Care. All 3 ways are really simple. Two of the three steps involve diffusing it. Both when I wake up in the morning and before bed at night, I pour 5-10 drops of Migraine Care into my diffuser. My diffuser is on my nightstand next to my bed. The soothing aromas of this essential oil blend immediately relax my mind, helping me to avoid the many triggers of my migraines. Maybe that’s why I haven’t experienced an attack since I started using Migraine Care. 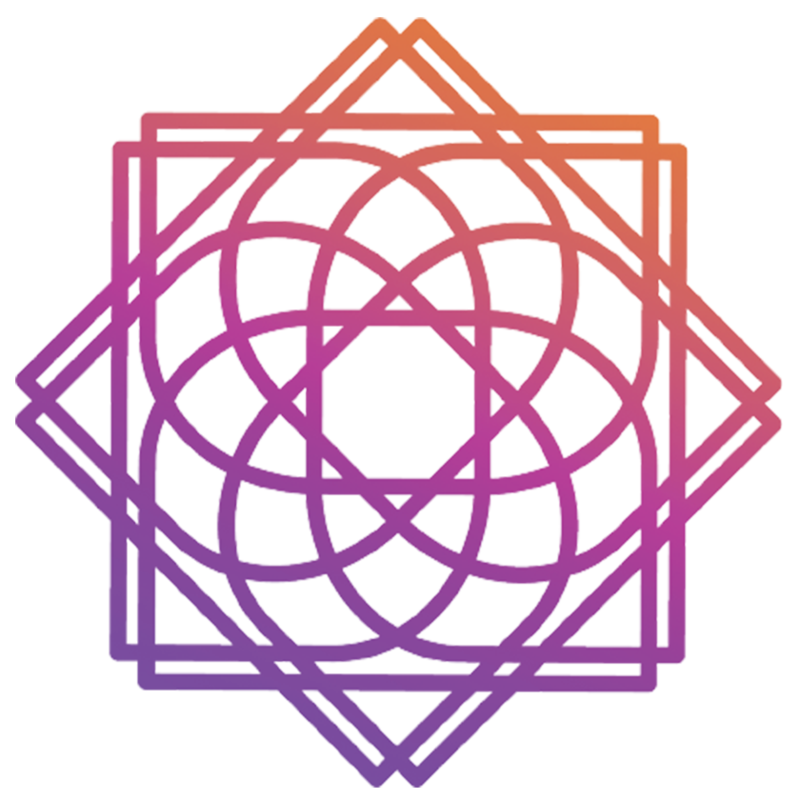 The second way I diffuse Migraine Care is with my Calm Diffuser Bracelet, which I received when I ordered Migraine Care. If you’ve never heard of a diffuser bracelet, they’re really cool. They are made with lava stone beads which are porous, allowing them to absorb and diffuse therapeutic oils throughout the day. Wearing the bracelet with Migraine Care helps me prevent migraines and allows me to keep instant relief ready whenever migraines strike. The Calm Diffuser Bracelet is made of white howlite and lava stone. White howlite is one of the best calming stones for relieving stress and anxiety. Lava stones are known to have grounding properties to keep you balanced while easing nervous tension and anxiety. 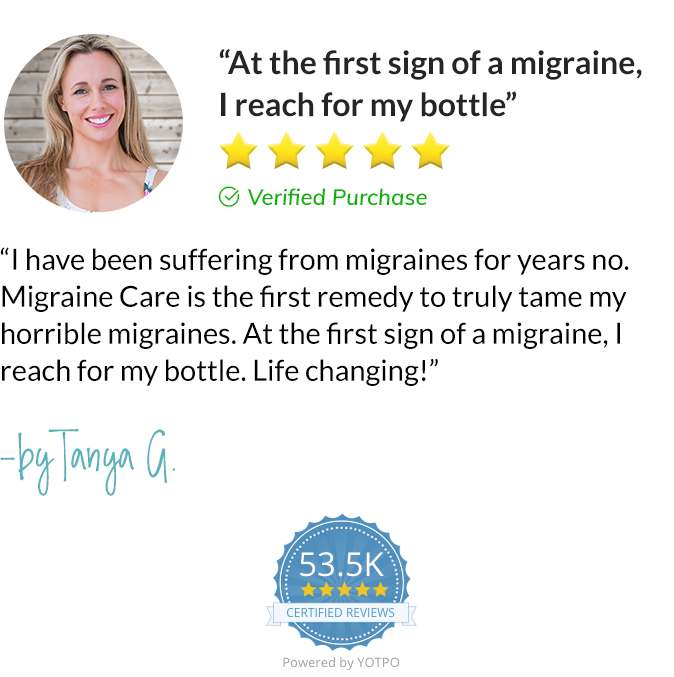 I simply apply Migraine Care directly on the lava stone beads with the free roll-on bottle that comes with the 30ml bottle. 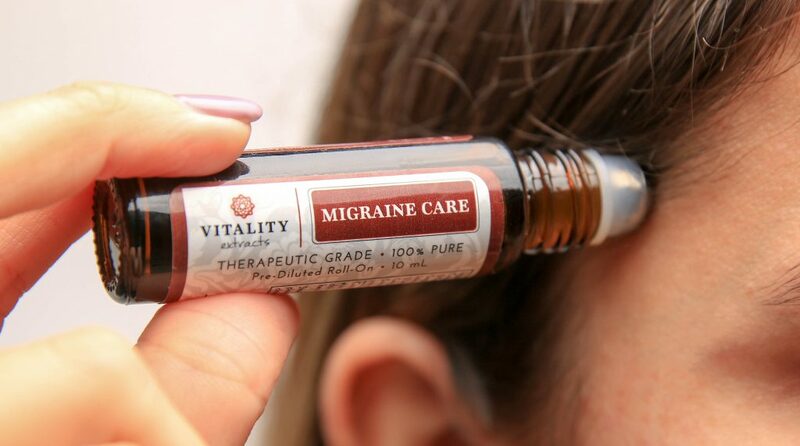 The third way I use Migraine Care also involves the roll-on bottle. Because the roll-on bottle is diluted with coconut oil, you can apply it directly to your skin. So all I do is apply the roll-on bottle to my temples and gently massage it in with my fingertips. Because I have a small desk at work, I don’t have the space for a vaporizer. But the roll-on bottle is small enough to keep with me anywhere and I use it anytime I feel the onset of symptoms. The convenient roll-on bottle is even TSA approved for air travel. I consider the roll on bottle and Calm Diffuser Bracelet my emergency first aid kits. I actually use them to prevent emergency attacks. But they give me the confidence to know that should I start feeling an attack coming on, I’ll have something on hand to offer immediate help. Where To Get Migraine Care? Migraine Care can only be purchased from its manufacturer. With more and more doctors turning their patients on to Migraine Care, its popularity has skyrocketed and the company has had a hard time keeping it in stock. 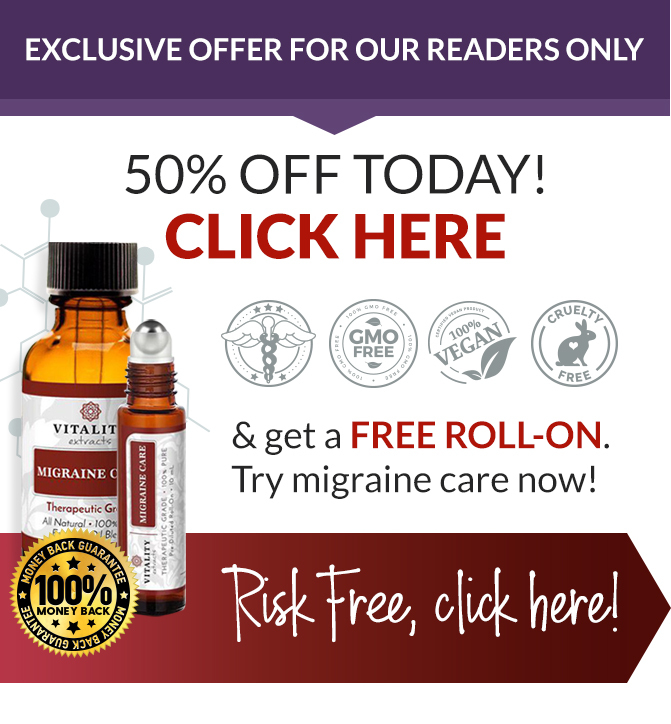 Currently the company is running a 50% discount and BOGO promotion: Buy one 30 ml bottle of Migraine Care, get one FREE ROLL-ON bottle (limit 3 free roll-on bottles per transaction). This is an exclusive, limited time offer and can’t be found anywhere else. Don’t suffer another day. 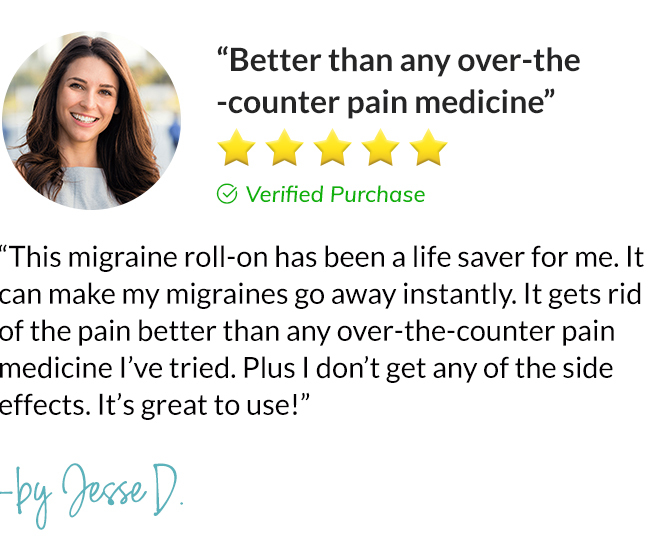 Order Migraine Care now. Just click on this link or the coupon below. I love my family and French Bulldog, Toby. My passion is health and wellness. When I’m not studying or writing, you can find me doing yoga or hiking.